Davenport, Iowa - St. Ambrose University honored the request of a survivor of clergy sexual abuse and removed the name of the late Bishop Gerald F. O'Keefe of Davenport from the university's 11-year-old library. The Catholic university's board of directors made the decision Aug. 3 in hopes of bringing about healing, said Davenport Bishop Martin J. Amos, the board's president. Shortly after the board announced its decision, two workers in a crane removed the letters spelling out "O'KEEFE" from the front of the building. The word "LIBRARY" remained. 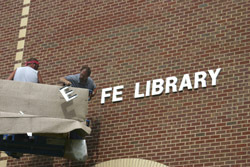 WORKERS REMOVE NAME OF BISHOP FROM LIBRARY BUILDING – Workers remove the name of the late Bishop Gerald F. O'Keefe from the library of St. Ambrose University in Davenport, Iowa. The university's board of directors voted to remove his name at the request of a clergy sexual abuse survivor who said the bishop failed to protect children. The Rev. Mark Powell of Indianapolis, the survivor, requested the change because he said Bishop O'Keefe failed to take the necessary precautions to protect children from abuse during his 26-year tenure as head of the diocese. In his own case, he was abused after he came to the Davenport Diocese in the late '70s as a teenager to join an order of religious brothers, and reported it to the bishop, who did nothing, he said. Bishop O'Keefe served the Davenport Diocese from 1967 to 1993 and died in 2000. Rev. Powell, a minister in the Christian Church (Disciples of Christ), expressed his appreciation to the board and thanked Ed Rogalski, the university president, "for his kindness and understanding throughout these past 11 months" since he requested the bishop's name be removed. Rev. Powell said he came to the diocese in February 1977 at age 17 to join the Franciscan Brothers of Christ the King. Abuse involving two of the brothers and one priest occurred from March through November 1977, he said. He identified the three as Brothers Francis Skube and Mark Quillen and Father William Wiebler. Rev. Powell said he told Bishop O'Keefe in 1977 and 1981 about what had happened and was assured that the bishop would take care of the matter; the bishop told the young man to keep silent. "History shows he did nothing," Rev. Powell said in an e-mail to The Catholic Messenger, Davenport's diocesan newspaper. Because the bishop failed to take action to protect children from abuse, Rev. Powell said he sought to have the bishop's name taken off the library. But the university did not have a policy for removing a name from a building; after receiving the request, the board of directors created one. An ad hoc committee appointed by Rogalski investigated the request and submitted its findings to the board, which determined the name removal was justified. "It was a good decision for a number of reasons; the predominant one was that perhaps it can bring about healing, at least for some," Bishop Amos said. "We're not making a judgment on Bishop O'Keefe because he isn't here to defend himself," the bishop said, but documentation indicates that abuse took place during his tenure and was reported to him.